Well the title pretty much sets up exactly what this blog is going to be about, it is an area I have not covered though I did need to go back to check as I can never remembered what I have and have not discussed, it is an area that I believe requires some dedicated airtime. Now there are a few different ways to approach renaming members, one of the methods which I am going to cover today involves going directly to the planning database tables and understandably might not be favoured by some, so in the next blog to be complete I am going to go through another method which is much more convoluted but stays on a supported track. 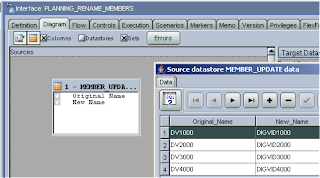 There are occasions when updating alias members is not enough and you have to resort to renaming members, there has never been any functionality through the available tools (ODI,DIM,HAL & Outline loader) to directly rename members. I am not sure why this functionality has not been provided yet as it doesn’t seem a complex area to build into an adaptor and would definitely be beneficial; hopefully the ability to do so will be made available one day. 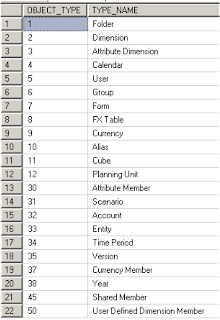 I have a source table that contains just two columns, one with the original member name and the other with the name I want to rename the member to, so nice and simple. In the planning applications relational database there are a few tables that we will need to use to be able to update the member names. 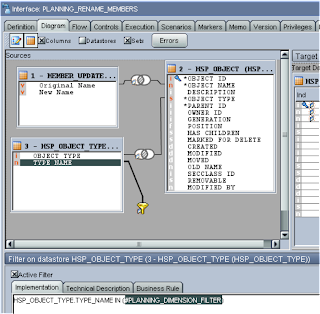 The first table and the most important is HSP_OBJECT, this is the core table in the planning architecture, nearly all other tables relate to this table in some way, and the key to it all is the OBJECT_ID, though this is not going to be a lesson on what’s in the table; it is only about the columns we are interested in. 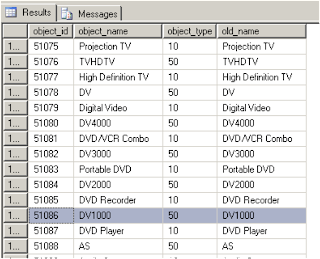 OBJECT_ID – Each object inside planning has a numerical id, so for each member there will be an object id. OBJECT_NAME – In our case this holds all the member name information. OLD_NAME – This contains the previous name of an object, so if a member is changed in planning the OBJECT_NAME will hold the new name and OLD_NAME holds the previous name. Some would argue that I don’t need to touch this column but I have see instances where the value can be null and just to be certain I am covering all angles I am including it. 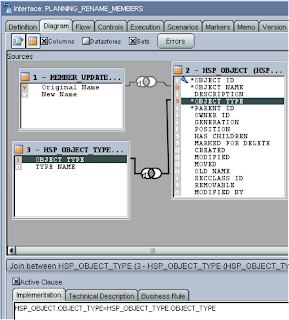 The next table is HSP_OBJECT_TYPE; this table hold descriptive information to what the object in planning is. The final table is HSP_UNIQUE_NAMES. As you are probably well aware member names/aliases all have to be unique with planning, this table keeps a record of all the unique names to make sure you don’t add a new member that already exists. 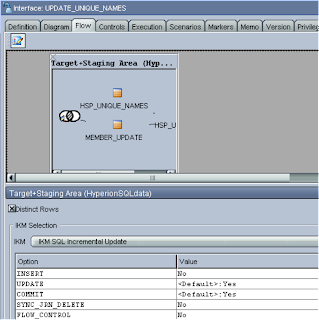 The table links back to the HSP_OBJECT table by the important OBJECT_ID. When we update the member name we will also have to update the name in this table to keep everything in sync. Now we have the source and targets sorted out we can move on to ODI. You will need to set up a physical connection to your planning applications database. I am not going into the details of setting up physical and logical schemas, if you don’t know how to do it then read back into my early blogs. I am also going to assume you have set up the schemas to your source data. 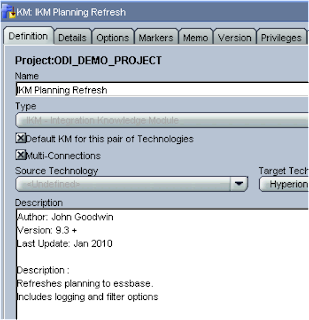 Before we start building an interface we need to make sure the correct KM’s have been imported, as the integration is updating the target then one of the IKM UPDATE knowledge modules can be used. When using UPDATE KM’s you will need to have a primary key, there is no need to worry in this example, as OBJECT_ID is already defined as a primary key in the tables. Ok, the first interface we require is one that will map our source records to the target (HSP_OBJECT) and updated them accordingly. 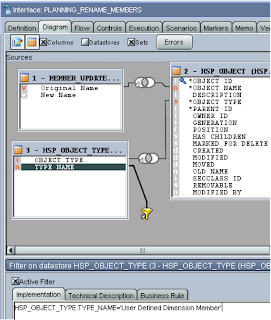 Create a new interface and drag the HSP_OBJECT datastore on to the target. 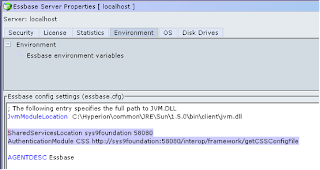 Now drag HSP_OBJECT and HSP_OBJECT_TYPE on to the source. 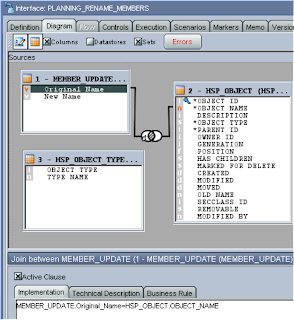 Create a join between “MEMBER_UPDATE”.“Original Name” and “HSP_OBJECT”.“Object Name” (drag “Original Name” on to “Object Name”) this will make sure we only update the records that match by name. This will let us define which object types to return in the query ODI creates, to make the definition a filter is required, drag TYPE_NAME on to the source area. 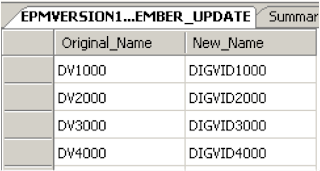 So this will only return the types of “User Defined Dimension Member”, if you want your interface to deal with more than one type of dimension member update you can easily add more logic into the filter e.g. Now we can perform the target mappings, which is straightforward. OBJECT_ID is mapped to the source. 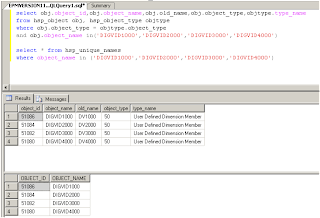 OBJECT_NAME is mapped to “New Name” as we want this column to hold the new member name. In the flow tab I updated the following parameters for the IKM. INSERT set to “No” as we are only interested in updating the target, we don’t want to insert any records. SYNC_JRN_DELETE & FLOW_CONTROL set to “No” as we don’t require this functionality. That is the first interface complete and we now need a similar interface that will update the HSP_UNIQUE_RECORDS table. Create a join between “MEMBER_UPDATE”.”Original_Name” and “HSP_UNIQUE_NAMES”.”OBJECT_NAME” as this will focus on only member names we want to update. 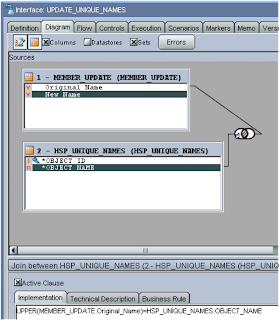 You will notice I have used the UPPER function (UCASE in Oracle), as the member information in HSP_UNIQUE_NAMES is all in uppercase so I need to convert my source member information to Uppercase before I map. I know in my example all the member names are in uppercase but they may not be in future. The target mapping is straightforward again. 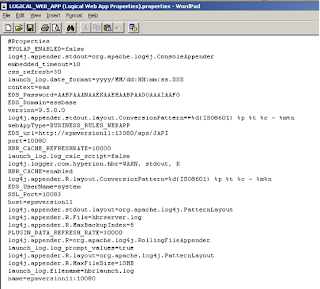 OBJECT_ID is mapped to “HSP_UNIQUE_NAMES”. "OBJECT_ID"
OBJECT_NAME is mapped to “MEMBER_UPDATE”.”New Name” and converted to uppercase. The IKM options are set up like the previous interface. So I now have two interfaces that should map to the source member file and update to the new member name information on both of the target datastores. Both interfaces run successfully and updates = 4 which is correct. A quick query on the planning tables and all looks good as the new member names are in place. This is where the blog could end but I am not so lucky, if you look in planning the original member names are still there, back with a vengeance is the planning cache in action, the cache still has the original names stored in it. There are a few options, easiest is just to restart planning and the planning cache will be refreshed but I don’t want to take that route as it may not be convenient to restart the planning web app each time a member is renamed. If you run a planning refresh the planning cache for member information is also refreshed so I could also create an interface that loads 1 record that already exist into the planning application and use the KM option of “REFRESH_DATABASE” set to Yes, this is fine but I want my to be able to use my renaming interfaces again and again and I don’t want to have to load one dummy record in each time. Ok, I could call the cube refresh utility by creating a procedure and using an OS command. What I need is an interface that just runs a refresh, is this possible? Well, after too much time spent digging around the java code trying to understand if it could be done I have come up with a solution and here is how it can be done. 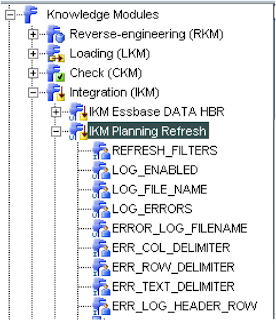 Right click the KM “IKM SQL to Hyperion Planning” and select duplicate, I want to keep my original KM so that’s why I am creating a copy. In the details tab delete the following commands, as they are not required. Edit the command “Prepare for Loading”, you can rename it if you like. Most of the code stays pretty much the same; I have just imported a couple of extra classes from the planning adaptor and used them later in the code. Here is the complete code if you want you copy and paste it in. print "Initalizing the planning wrapper and connecting"
I left in all the logging options, they won’t really tell you much other than the connection to planning was successful. I also added into the code the option to refresh filters or not which takes me on to the options, some of them I removed because they are not required anymore. To save you time on creating the KM, you can download it from here. To use the refresh KM in an interface you just need to create an interface set a staging area, I usually use the sunopsis memory engine as no processing is done in the staging area it is just used so the interface will validate. Drag any planning dimension datastore on to the target, it doesn’t matter which dimension, it is just being used to generate the correct connection details to the planning application. 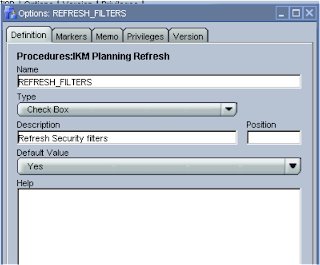 In the IKM options you can define whether or not to refresh the security filters, I doubt you will see anything being generated in the error log and I probably could of removed it. 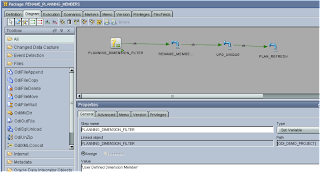 Now you have an interface that can be used again and again for refreshing planning, to change which planning app it refreshes is also simple, either drag a different datastore on to the target or just update the physical connection information in the topology manager. To put it all together I created a package. As you can see I added a variable that I set to define the planning dimension type of the members that will be renamed. I updated the renaming interface to use the variable, this gives the flexibility to quickly change the dimension I will be renaming members for or just include all the dimension types. The complete flow is :- Set Planning Dimension variable, Rename Members interface, Update unique members table interface and finally a planning refresh. 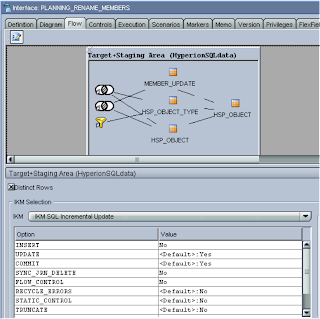 The interfaces can easily used for different planning applications by either dragging a different datastore to the targets or by updating the physical connection information in the topology manager. So in the end I have a solution that can be easily ported to any environment where I need to rename members. As usual I thought this blog would be really quick to write up, it always seems quick in my mind until I go through it all step by step. Next time I will go through the alternative method of achieving the same end game but without having to go directly to the planning tables. 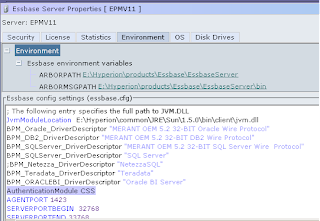 EPM Version 11 – What property files? Just before I start I would like to point out this blog is based on version 11.1.1.3 and no doubt the contents are subject to change in future versions. A number of times question have been raised about the location of property files in version 11. 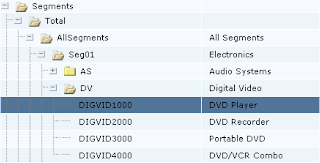 Pre version 11 there are a multitude of property files to contend with depending on the product. I have always contested why the need for so many files and it would have been useful if they were consolidated and more information provided on what they are used for, in version 11 the storage of certain property files has certainly changed. 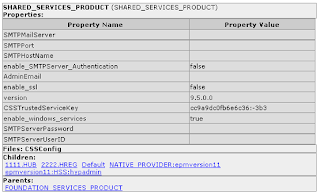 The Shared Services Registry is part of the database that you configure for Shared Services. 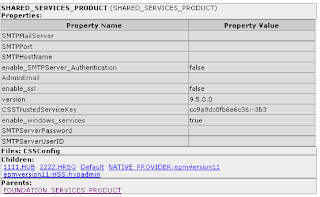 HBRServer.properties – contains configuration information for business rules, such as connection details to the EAS repository, this file can usually be found in the EAS installation directory and within the planning web application server so planning can connect to HBR. 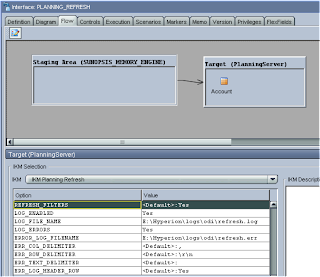 PlanningSystemDB.properties – contains connection information to the planning system repository and can be found with the planning web application server. 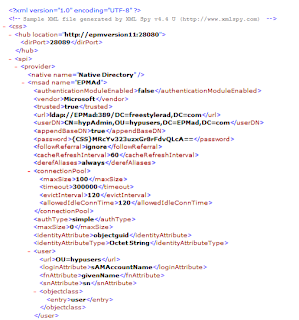 CSS.xml (shared services configuration information), shared services web application server uses this file to collect information about native/external providers such as MSAD configuration details. Other products such as essbase would retrieve this information by querying Shared Services directly, if you look in the system 9 essbase configuration file you will see the url it uses to retrieve this information from HSS. Right so there are a very small selection of some of the property files used in System 9, in version 11 these files either don’t physically exist or if they do exist they are not used anymore and the information is read from the HSS registry. 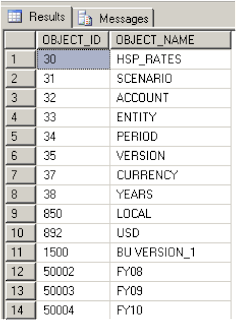 At present it can get extremely confusing because some property files are still being used in the same way, for example many of the financial reporting .properties files are still being and are not part of the HSS registry but I am not going dwell on that today. This file contains all the repository connection information to the HSS registry and each product now reads the file to find the location. Going back to essbase, if you have a look in the essbase.cfg in version 11 you will notice a difference from the system 9 version. The URL has been removed, in version 11 essbase has been updated so when started up it checks the value reg.properties and connects to the HSS registry and then retrieves the CSS information. 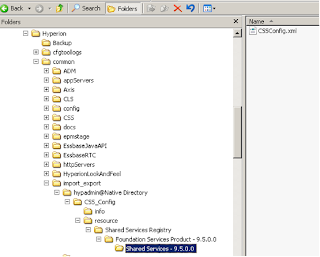 If you do see that message it is always useful to examine the SharedServices_Security_Client.log which is in the same directory. 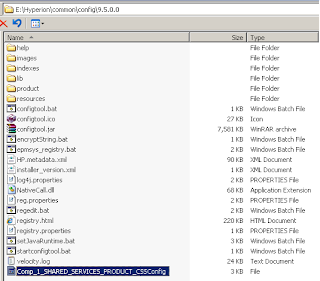 Anyway back to the HSS registry and property information, if you want you want to find out what is stored in the registry you can run a script (epmsys_registry.bat or epmsys_registry.sh) in the \Hyperion\common\config\9.5.0.0, this will generate a html document (registry.html) with details of all the stored information in the registry. The number of properties stored can be quite extensive depending on the number of EPM products you have installed on the machine. Ok, so how you do you change a value of one of the properties? Well there are two official methods (yes two I am not hacking the tables which may be considered a third and dangerous option) and I will go through them both. The first and probably the quickest/easiest method is to use LCM. If you logged into Shared Services, expand Application Groups and then Foundation you will see the option of “Deployment Metadata”, click on this. You will see “Shared Services Registry” in the right hand pane, expanding this will drill down to the different products and property options, so let’s stick on the same track and extract the CSS information. Tick “CSS Config” and click the “Define Migration” button. You can launch the migration status report to see the current status of the LCM export. 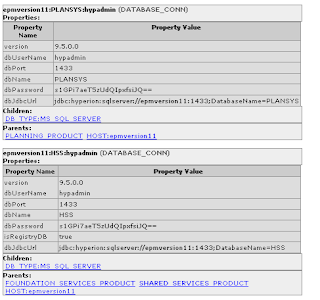 It is pretty much the same as the old HBRServer.properties file except it does not include the database connection details as they are stored under (Database Connections). Once you have edited your property file it is pretty much straight forward to import it back into the HSS registry using LCM. 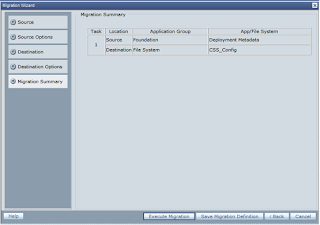 In Shared Services expand “Application Groups” > “File System” and select the name to used in the LCM export. Tick the value in the right hand pane and “Define Migration” button. On the destination Options screen select the Operation Type of “update” as the details already exist in the registry and we just want to overwrite them. Then it is just really executing the migration and all being well the properties will be updated in the registry. That is the LCM method but say Shared Services was down for some reason, say the MSAD details were now incorrect and it was stopping Shared Services from starting up, you still need to access the CSS information and this can be down using a command line route. 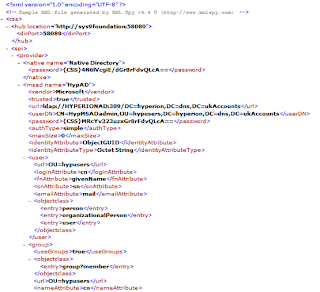 It is using the same batch script (epmsys_registry) that was run earlier to generate the html report. The componentType is the full path and component name you want to export, to get this information you have to look the html report (registry.html) that we generated earlier, it does not follow the same path name as used in the LCM route. Note is also against files as it is stored as a file in the HSS registry. Now we have to generate the full path, the current path is SHARED_SERVICES_PRODUCT as shown in the top of the table and its parent is FOUNDATION_SERVICES_PRODUCT as shown at the bottom of the table. 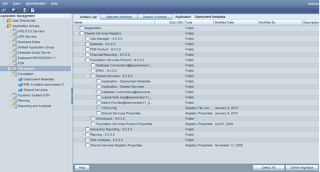 But this is not the full path if you click the FOUNDATION_SERVICES_PRODUCT link it will take you to its parent. The file in this case is exactly the same as CSS.xml or CSSConfig.xml and can be edited with any text editing application. The file is loaded back into the registry overwriting the existing one. If you want to view/update a property that is not file related then it is pretty much the same process except the syntax is slightly different to update. As it is file related the value is just outputted to the command line window. To make sure that the property has definitely been updated you can just generate the registry report again. Right, hopefully you kept with me and have understood about the Shared Services registry and know how to update properties if you ever have to.